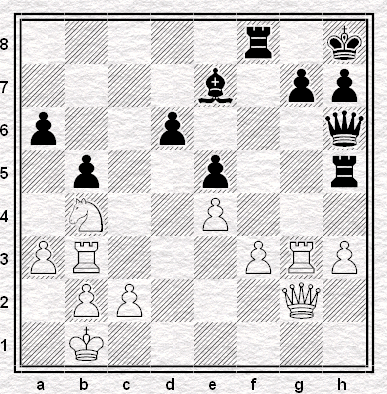 Here's the crucial position - allegedly - in Anand's win over Morozevich in the eleventh round on Tuesday. An important moment in modern chess history. Anand's most dangerous trailers, Kramnik and Gelfand, had finished their games hours earlier and a draw would have maintained his comfortable lead in the tournament. The ambitious decision to play on will lead to a slightly irrational position, without any safety net for White. Therefore, Anand deserves the highest praise for the way he chose to climb up to the highest peak of the chess pyramide (sic). This is the kind of World Champion the public needs. Oddly, annotating in the daily e-newsletter, Chess Today, IM Max Notkin makes no mention of this "important moment" at all. It's not available online (you have to pay to receive it and I recommend you do) so you'll have to take my word for it. But it's strange, if it's so important, that a player of master rank should apparently overlook the possibility of a repetition. Particularly as the last two moves have been 30...Rh4-h5 31.Qg2-f1 Rh5-h4 32.Qf1-g2 Rh4-h5. Instead Notkin merely notes that 31... Bg5 would have been undesirable (32.Nxa6 Bf4 33.Qg1 Rxh3 34.Qxb5 "with an edge to White") and 32.Nxa6? an outright error (32...Rxe4). I wonder why? Could it be that he doesn't think that a repetition was actually on the cards? That it never occurred to him that Anand would take it? Because rather than taking a serious risk Anand was simply preferring to play on in a position where he considered himself rather better? He could have taken a draw, for sure, but why not take a look first, see what Morozevich wants to do and then play on? At best it was surely a calculated risk rather than some leap into the unknown. He was going to have a safer king and a giant knight on d5. With those positional advantages was he really running much risk of defeat? Perhaps it wasn't a praiseworthy decision so much as a pragmatic one. It's funny, though, this early-draw thing. I mean what are we to say about the player who took a 21-move draw in round six and then a 20-move draw in round eight? And then followed it up by agreeing, with the White pieces, a 21-move draw in round nine? Nothing at all, I should think. Because our apparently draw-addicted subject wasn't Vladimir Kramnik. It was Viswanathan Anand. a don't necessarily disagree with a lot of what you say but perhaps we have a difference of emphasis. I would say the KEY difference between the Anand draws and the Kramnik one was that Kramnik was world champion and he chose not to go to any lengths to try to defend the title. I was hoping for better - though I'm not sure why when you consider, e.g., Kasparov giving up in 2000 with a succession of micro draws with White (and, now I think of it, Anand limped away from a title challenge in 1995 with any number of non-event draws). one other key difference we haven't touched on yet. A short draw is a short draw but Grischuk - Kramnik was a total non-game with no fight what so ever. I don't doubtr that the fact that Kramnik has another match available to him may well have made a difference to his approach. But I'm not sure how far it's justified to have one approach for him and a completely different approach for everybody else. As far as I can see they're all competing in the same event and face the same problems of tactics and psychoogy. Of course it may very well be that anybody could or should have tried a more aggressive approach: it's a fair suggestion. But I think people should take into acount that it's not just entertainment, it's a desperately hard struggle for the world championship and people really aren't going to play coffeehouse chess for our benefit. Short draws happen in top-level chess and happen for rather better reasons than laziness or cowardice - something that Leontxo García, for instance, knows very well, which makes his comments particularly objectionable to my eyes. And at this level, it really does matter if you're White or Black. Incidentally, how many moves did Anand play last night? Whilst trying hard not to take a specific position on the "is Kramnik a coward?" debate, I really don't think your general line, Justin, holds up. By that i'm referring to equating Kramnik taking quick draws and Anand (I fully agree that if you criticise Kramnik, you've got to criticise Gelfand, and incidentally IMO Aronian in his black game against Anand). Anand is leading the tournament. There is no onus on him to take risks. Wrt to whether he was "courageous" in his game against Morozevich really depends on the extent to which he personally felt he was taking a risk. Which is something only he really knows. Comparing a non-risk taking approach from a leader compared to one who is chasing is akin to comparing a team in football who take all their strikers off when 1 or 2 goals up to a team who do so when 1 or 2 goals down. In both cases they are potentially denying the audience but in a results oriented world, only the team chasing damage limitation can really be justifiably criticised in the generality. Mmm, but isn't there this argument being put about that Kramnik's under some sort of duty to play more aggressively? Nothing to do with tournament position per se? Whereas if we're talking about tournament tactics, isn't Kramnik just as entitled as Anand to think that playing for a win with Black might in given circumstances not be the right tactic? After all, a team that's a goal down doesn't necessarily shove everybody up front when the other side has a corner, does it? Of course it's reasonable to ask - had Kramnik given up the ghost? He may well have, but I don't think we can draw that conclusion on the basis of him selecting the Petroff in that particular game with Black. In a way, that's again what I mean about the interpretation suiting the narrative. Because everybody thinks ah, the Petroff, that's a boring cowardly opening. Well, it's a draw if White wants it to be. But then again - Kramnik had a ding-dong battle with Gelfand last night and everybody will think that that's better, the Semi-Slav is a real opening. But suppose White had played 3.cxd5? Should Grischuk have got on with it? Should Gelfand have gone for it? White To Play, & Mate! "The Human Punchbag Fights Back"